Salisbury & Moore Construction, Inc. has been awarded “General Contractor of the Year 2016” by Apple Hospitality REIT, Inc. Apple Hospitality REIT is a publicly traded real estate investment trust (REIT) that owns one of the largest portfolios of upscale, select service hotels in the United States. The Company’s portfolio consists of 179 hotels, with approximately 22,950 guestrooms, diversified across the Hilton® and Marriott® families of brands with locations in urban, high-end suburban and developing markets throughout 32 states. The award criteria included: number of rooms out of service within the project criteria; cost controls; consistent job reporting; minimizing impact to guests during construction; and consistent and constant communication with the project management and property management teams. 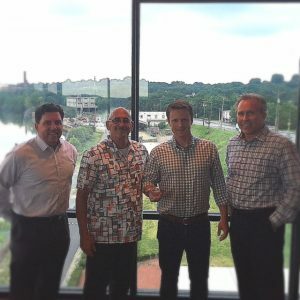 (Left to Right) Bryan Wingold – Senior Project Manager with Apple REIT, Lou Guimond – Project Manager with SM, Andrew Harvick – VP of Operations at SM, and Kelly Miller – President of SM.